A company provides services to government-sponsored health care programs. It operates via two segments: Managed Care and Specialty Services. Centene is headquartered in St. Louis. The company applies very for trend following strategy when the current bull trend will be driven higher securing profits for the investors. The revenue has been constantly growing on an annual basis and the last four reported earnings have beaten the estimates always. The most recent earnings crushed the estimates big time – by almost 11%! Volume – extremely high volume as a result of the earnings. Investors want an ownership of this company and they want to keep it. This is a very important sign. 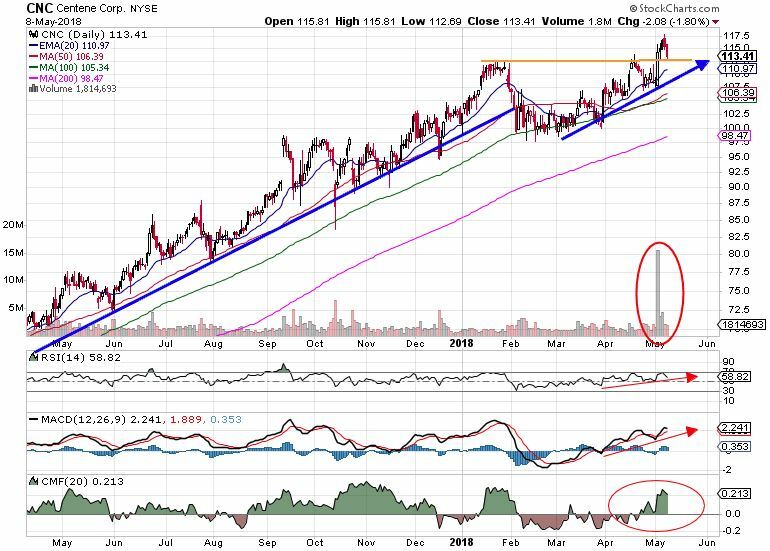 RSI – positive and going upward, well applying to Cardwell theory. MACD – MACD line above the signal line. CMF – Strong buying power. Centene Corp. offers a great investing opportunity. Important is to stay disciplined and focused on the big picture!